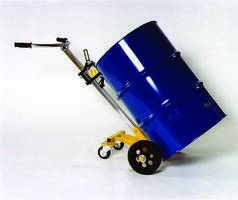 The 10HT-4W 4-wheel Hand Truck is designed for rimmed steel, fiber and plastic drums weighing up to 1000 lbs. The unit consists of two 10 in. main wheels with full roller bearings and two 4 in. 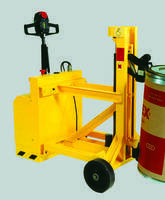 swivel casters for supporting the drum while moving through plants and warehouses. 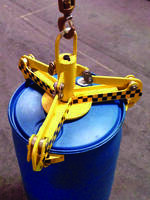 The Parrot-Beak® mechanism allows user to handle drum sizes ranging from 10 to 85 gal. Buffalo Grove, IL Liftomatic Material Handling, Inc., an industry leading material handling equipment manufacturer, recently introduced a new 4-wheel hand truck, the Liftomatic 10HT-4W. The Model 10HT-4W is a 4-wheel hand truck designed to handle all rimmed steel, fiber and plastic drums weighing up to 1000 pounds. It is designed with ergonomic safety in mind, eliminating the need for an operator to bear the weight of the load during transport. The drum truck has two 10" main wheels with full roller bearings, and two 4" swivel casters to support the drum while moving through plants and warehouses, in addition to Liftomatic’s exclusive “Parrot-Beak®” clamping mechanism. 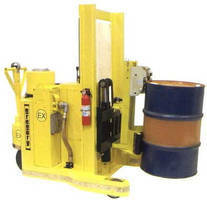 Other features include a clamping mechanism that can be adjusted to handle all drum sizes from 10 to 85 gallons. Truck Crane provides on-board reach of 200 ft .